MedixSafe is the leader in narcotics security solutions. Memphis, TN: Customer demands has prompted MedixSafe to develop a new, compact cabinet for narcotics storage and security. The MS, with dimensions of only 7” high x 8” wide x 10” deep. The MS will become the smallest MedixSafe product available and one of the smallest on the market. The MedixSafe MS will make its debut appearance in June at Fire 2014, the New York State Association of Fire Chiefs Fire, Rescue, and EMS expo. The expo will be held June 11-14 at the Turning Stone Resort in Verona, NY. MedixSafe is the leader in narcotics security solutions. With the addition of the MS, MedixSafe offers six different size cabinets with a variety of configurations. MedixSafe M1 is the ambulance trade’s first, simplest dual access security solution. Incorporating both proximity card readers and PIN pads, M1 technologies allow for individual accountability and automated record keeping -assuring compliance with new, stricter regulations. MedixSafe M2 is the ambulance trade’s most technologically advanced triple access security solution. Incorporating both fingerprint scanners and PIN pads, M2 technologies allow for the highest degree of individual accountability and automated recordkeeping. MedixSafe MX1 and MX2 are larger than the M1 and M2 with all the same features; Biometrics, PIN, and proximity card. MedixSafe C2 is the most technologically advanced triple access security solution for small pharmacies and clinics. 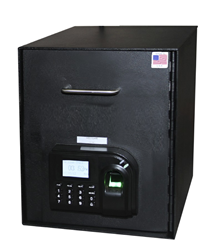 Like the M2 Narcotics Cabinet, incorporating both fingerprint scanners and PIN pads, C2 technologies provide the highest degree of individual accountability and automated record keeping in a larger cabinet, ideal for narcotics storage in small pharmacies and clinics. The larger C2 dimensions are 24” tall x 18” wide x 18” deep. MedixSafe CW - The perfect solution for a wall mount application! The MedixSafe CW is the most technologically advanced triple access wall mount security solution. Like the C2 Narcotics Cabinet, incorporating Biometrics, PIN and/or Proximity Card to gain access, CW technologies provide the highest degree of individual accountability and automated record keeping in a wall mounted cabinet. Ideal for narcotics storage. The S2 Narcotics Cabinet incorporates Biometrics, PIN and/or Proximity Card to gain access. The S2 has two separate compartments, each with their own Triple Access security solution. Each compartment is also equipped with a 1,000 lb. locking mechanism. Unit dimensions are 48” high x 40” wide x 29.5” deep. The S2 weighs 65 lbs. and is available with caster wheels for easy placement. MedixSafe Wi-Fi upgrade is available on all models. The MS will be available for order in June 2014. Pictures of the new MS model have yet to be released. For more information contact MedixSafe at http://www.medixsafe.com/contact or toll-free 855-MEDIXSAFE.